Life-changing: Helen Gillam, Sr Cetah, Sr Betty, Catherine McAleer, Sr Marivic and Amy Davis outside the Our Lady of the Sacred Heart Integrated School; and (left) Amy Davis with children in the Philippines. WOMEN from Toowoomba diocese have made a life-changing trip to the Philippines to make the lives of people better. Catherine McAleer; Helen Gillam, from St Mary’s School, Warwick; and Amy Davis, from St Patrick’s School, Mitchell, made the trip with the purpose of helping to set up a small school library for the Daughters of Our Lady of the Sacred Heart in Cordova. They also ran professional development days for volunteers and sisters from Surigao who run tutorial programs for the Badjao people and a separate professional development day for kindergarten and special education teachers from Marigondon Elementary School. “The days were long and at times frustrating but they were perfect,” Ms McAleer said. “What an honour and a privilege it was to work with both Helen and Amy. “Helen took to the task of setting up the library like breathing. “Under her guidance, books were sorted, catalogued and prepared for borrowing. “In five days the library was set and ready for the children to enter when they return from their summer break. “The sign of a great teacher is flexibility and adaptability, and Amy exemplified both these qualities and many more. Ms Gillam said the trip had a profound effect on her. “No one had told me about the noise, the traffic and the large numbers of people in Manila and Cordova; it all overwhelmed me, really,” she said. “The hospitality and generous nature of the Filipino people cannot be measured. “They were extremely welcoming, gracious and willing to show us around. “Our first day in Manila was an eye-opener for me. We met a little family who lived in a box on the street. “What made this all too hard to understand was that this very street also had residences that were obviously owned by those with extensive financial resources. Ms Davis said she had never been to the Philippines and could only imagine what it would be like. “I knew there would be poverty and some children receiving little to no education but the reality of this was not what I expected,” she said. “The contrast between the wealthy and the poor was extreme. “There were people driving the latest cars past massive shopping malls while there were people living in cardboard boxes or in carts that they shifted when they needed to. 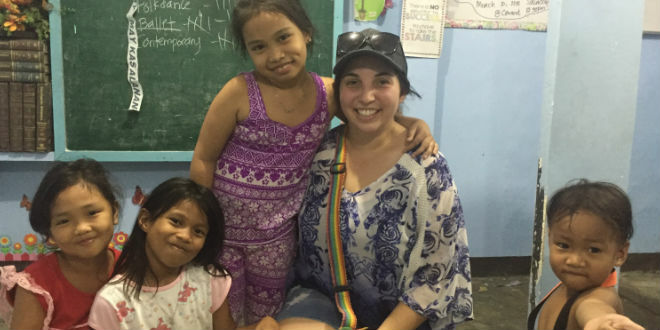 “The community that we visited in Manila was another eye opener. “Their homes were stacked one on top of the other with a basketball court in the middle. “The people of the community were very welcoming and the children greeted us with blessings and then followed us, as we were shown around the community. “This journey was an amazing one and I love the fact that I get to share it with my own students, school and wider community.